It's easy to feel overwhelmed at the fish counter. Which is tastiest? Which is healthiest? Which is the most sustainable choice? Fish provides a good source of protein, vitamin B, but more than half of Americans seldom eat it. Partly because of all the confusion, more than half of Americans seldom, if ever, eat fish, and if they do, it's usually at a restaurant. That's unfortunate because fish, particularly those high in a type of healthful fat called omega-3 fatty acids, can confer substantial health benefits. Moreover, fish is easy to cook at home. Here you'll learn the essentials so you can choose the tastiest, healthiest, and most sustainable fish at the market and enjoy it at your table. Top chefs often feature "day-boat" fish caught locally on restaurant menus, but unless you live near water, it can be challenging to find the freshest fish. Often the fresh fish you buy to prepare at home has been frozen. Fish sold as fresh can be anywhere from one day to two weeks out of the water. Large fishing vessels may stay at sea for two weeks, keeping their catch on ice to sell fresh. Even locally caught fish may take days traveling from boat to truck to wholesaler to retailer to your kitchen. For top quality, look for "Frozen-at-Sea" (FAS) fish that has been flash-frozen at extremely low temperatures in as little as three seconds onboard the ship. When thawed, sea-frozen fish are almost indistinguishable from fresh fish, according to the United Nations Food and Agriculture Organization. The USDA requires all fish to carry a label stating if it's wild-caught or farm-raised and identifying its country of origin. •Line- and net-caught fish: Line-catching includes hook and lines used for recreational fishing, longlining (a main line carrying several thousand short lines), and trolling (several unconnected lines slowly dragged behind the vessel). Line-caught fish are generally higher in quality than those caught in a net. •Farmed fish: Aquaculture -- the practice of raising fish in enclosed ocean pens or freshwater ponds or tanks -- has expanded dramatically in the last 30 years and now supplies about half of our seafood. •Aquaculture: Farmed fish help ease strain on over-fished species, but when raised in open-water pens, harmful organisms can migrate from pens to wild fish. Also, carnivorous fish, like salmon, eat fishmeal produced from decreasing stocks of smaller fish. 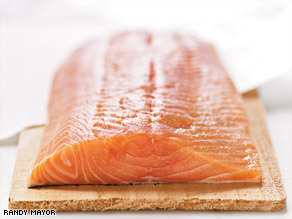 Farmed salmon is generally higher in contaminants like PCBs, a reason why many environmental organizations place it on their lists of fish not to buy. But in a study published by the Journal of the American Medical Association, scientists calculated that if 100,000 people ate farmed salmon twice a week for 70 years, the extra PCBs could potentially cause 24 extra deaths from cancer but the salmon consumption would prevent at least 7,000 deaths from heart disease. •Mercury: Carnivorous fish contain higher levels of mercury, which they absorb from prey. Mercury interferes with brain development in fetuses and children. The Harvard School of Public Health advises women who are or may become pregnant, nursing mothers, and children to eat two servings per week of fish and avoid the following: shark, swordfish, tilefish, and king mackerel. Fish contains 17 to 25 percent protein and is generally a good source of B vitamins, especially niacin, B12, and B6. Fatty fish are good sources of vitamins A and D. The small, soft, edible bones of fresh sardines and smelts and canned bone-in fish like salmon are valuable sources of calcium. Saltwater fish also contain minerals, including iron, iodine, phosphorus, and selenium. Fish is low in cholesterol (50 to 90 milligrams per 100 grams). •Omega-3s: Omega-3s are types of healthful polyunsaturated fat. They help improve cardiovascular health by controlling cholesterol and reducing blood pressure. They've also been linked to brain function and mental health benefits such as lowered rates of depression and dementia. •Dietary recommendations: Although the Dietary Guidelines for Americans do not make specific recommendations regarding seafood, other public health organizations, like the American Heart Association and American Dietetic Association, recommend two servings weekly because seafood is a quality protein source that is high in "good" fats. •Proper Portions: A 6-ounce fish fillet is about the size of the contents of a can of tuna when raw. When cooked, it will weigh about 4.5 ounces. Allow 12 ounces per portion uncooked for whole fish, 10 ounces for pan-dressed (headless) fish, 8 ounces for bone-in fish steaks. •Choose a quality fish market: Choose a fish market with knowledgeable salespeople. Fish should be displayed attractively and surrounded by plenty of clean crushed ice. •Be flexible: The best approach to buying and eating fish is to aim for variety. You'll consume fish of varying omega-3 levels and from a variety of sources without over-dependence on one. Let freshness be your guide. It's easy to substitute one fish for another (see Types of Fish), so if the mahimahi looks and smells fresher than the pompano, buy it instead. •Handle properly: When shopping, ask for your fish to be packed with a separate bag of crushed ice to keep it cold. Refrigerate whole fish up to two days; fillets and steaks one to two days. Place the fish in a plastic bag, then top with a zip-top plastic bag filled with ice. Thaw frozen fish in the refrigerator. To defrost safely and quickly in one to two hours, place the fish in a sealed plastic bag in a bowl of cold water, changing the water often. •Try whole fish. Whole fish shrink less than fillets when cooking, giving you more value for your per-pound price. Whiting, croaker, porgy, and Pacific rockfish can be great values. Also, consider summer flounder (sometimes called fluke), red snapper, farmed striped bass, and Arctic char. Pregnancy and fish-- what's too little or too much?